Happy St. Patrick's Day! You best believe we were are claiming all 25% of our Irishness today. Maybe less, but who's really keeping track. I'm not blaming the photographer. They're just a goofy, blurry bunch. At least they're smiling. We tried to get a shot with Yiayia and the kids too. We were lucky enough to grab ONE clear shot with all eyes open and looking toward the camera. I really need to find some better Photoshoping skills. The last time I wore this shirt was on St. Patrick's day 5 years ago when Mia was just 6 months old. I could not find the picture of the two of us from back then, but we tried to recreate the shot anyway. Oh, hello photo-bomber, join the party. Hey, where's that third kid? Does he have a spray bottle pointed at his face? Yes. He does. He has a water bottle pointed at his face and he's spraying himself repeatedly. Stop spraying yourself in the face and drenching your entire front side. We had a full day of church, work, play and good eatin'. James made a scrumptious shepherd's pie and we finished the night with these lucky ducks. 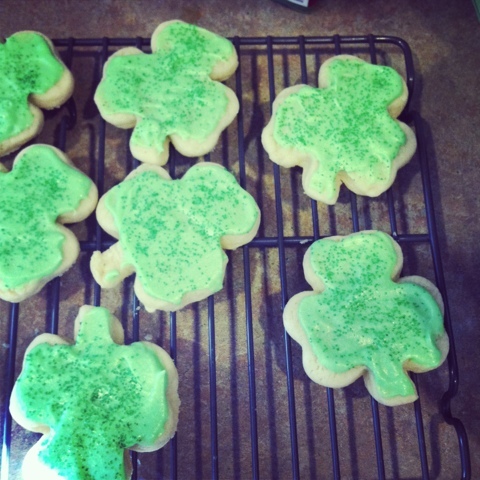 They are my sister-in-law's recipe - perfectly soft, cake-like sugar cookies. Recipe will be up on the house blog tomorrow. Hope you all had a great weekend and go pay Fine Linen & Purple a visit for more churchly attire.